This post has been sponsored by Four Monks. All thoughts and opinions are my own. If anyone would have told me years ago what a struggle it would be to keep white laundry, white. . .I wouldn’t have believed them. 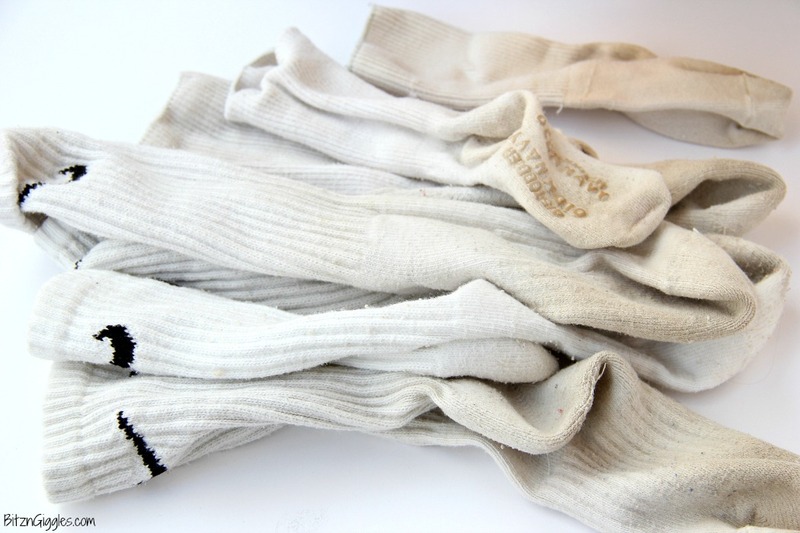 Growing up, my mom would soak socks in bleach before washing them in a hot water wash. We did laundry on Mondays and Thursdays, and I’m pretty sure our family had some of the whitest socks on the planet. I mean, put your sunglasses on, friends, and do not look directly at them! So, bleach does work well if you can babysit it and take it out after 5-10 minutes. I did forgot once and I lost a ton of socks – all the elastic went out in the socks due to the chemicals in the bleach and I had to toss them out. 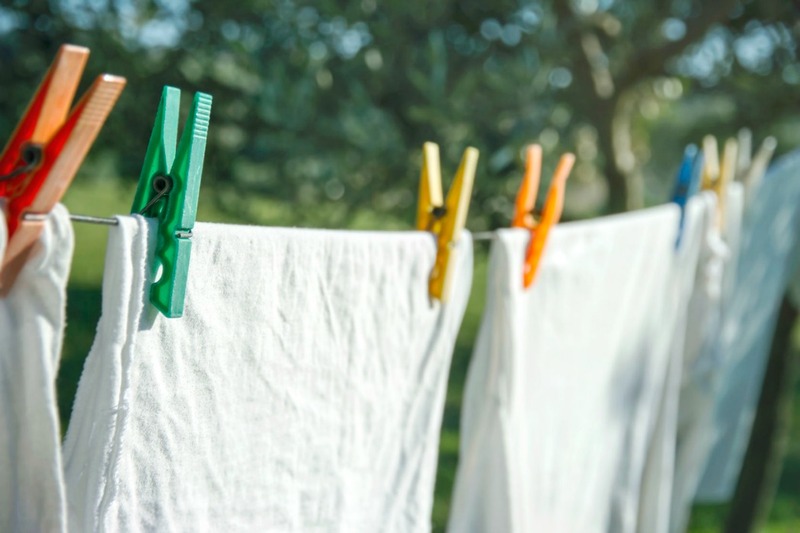 Today, I use a more natural laundry solution to whiten my whites and I’m assuming that’s why you’re here, too – because you’re looking for a better solution. 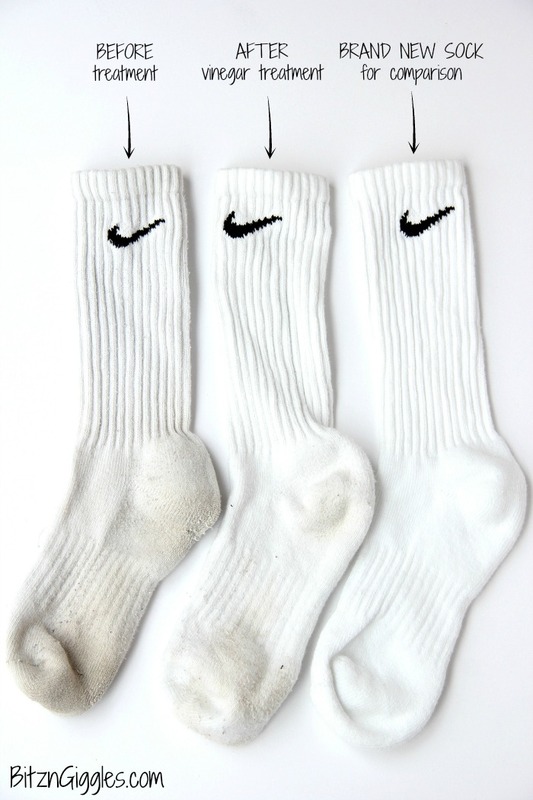 Before we begin, however, can someone tell me how kids can get their athletic socks so dirty? In winter they’re changing from boots to shoes and then back from shoes to boots multiple times in the school hallway. That means they’re stepping in wet puddles of dirt, snow and sand. . .every day. In spring and fall they’re jumping in mud puddles with rain boots that aren’t 100% waterproof. In summer, they’re running outside to talk to their friends without bothering to put on shoes. This is a year-round challenge, the struggle is “real,” and their poor socks go from bright white out of the package to dirty and dingy in 24.0 hours. Rant over. Luckily I found a solution that made me want to start using vinegar in all of my cleaning recipes again. Remember when I shared my recipe for Lemon Lime Vinegar? I’m really not a fan of the scent of vinegar which is why I’ve always doctored it up. That is, until I found a vinegar that doesn’t smell like vinegar. Yep, it’s true. Four Monks™ Cleaning Vinegar is made with distilled vinegar from corn, water and natural flavor, and get this – it’s 20% stronger than traditional vinegar! Perfect for deep-cleaning and stain-fighting. It comes in two scents, Aroma Controlled and Citrus Mint. The scents aren’t overpowering at all; they’re really quite pleasant. 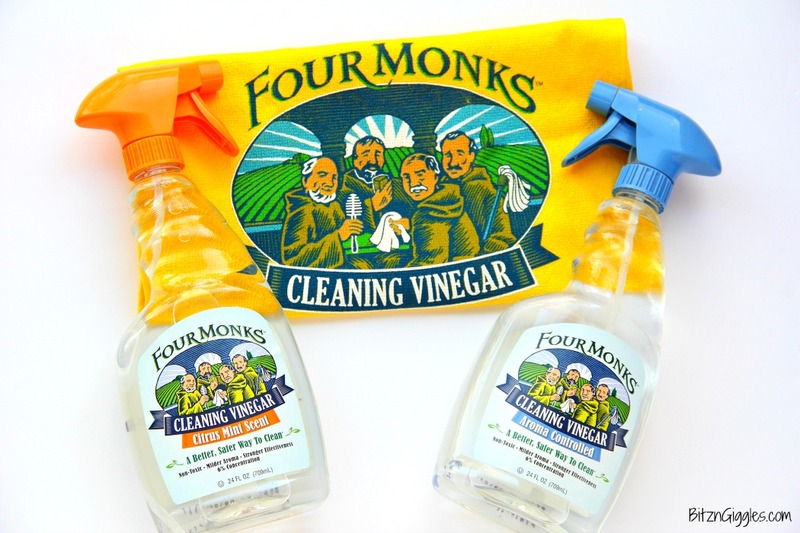 Four Monks Cleaning Vinegar is all-purpose, non-toxic, environmentally-friendly and safe for my family. THAT’S the type of cleaner I’m looking for. Check, check, check and check. So, because I like to multi-task, I have a lot of things going on in my home at once. I may be doing laundry, making dinner, helping kids with homework and letting the dog out to go potty all at the same time. If you have a family and your household isn’t like this, I’d be surprised and you need to let me in on your secrets. There are only so many hours in a day and there’s a lot to get done. And that’s why I love this method for whitening whites. . .because you can set it. . .and forget it for 24 hours! Do you hear angels singing? Fill the stock pot about half way with warm water and set on stove burner. Pour in the Four Monks Cleaning Vinegar and heat stock pot on high heat until water begins to boil. Add socks or clothing to stock pot and stir to cover clothing completely with the vinegar solution. Remove the stock pot from the burner and allow to sit for 24 hours. After 24 hours, wash clothing as normal with detergent using hot water and dry outside on a line or in the dryer. Bonus Tip: If you can hang your laundry outside in the sun, the whitening effect will be even greater. The sun acts as a natural “bleach” and paired with the vinegar it can have awesome effects. So, are you excited to see the results? I wanted to throw a brand new sock in the mix for comparison so you could see the real difference of before and after the treatment. While the treatment didn’t bring the sock back to looking “brand new” I think it did a heck of a job brightening it up and extending its life. Want to see the process in action? Of course you do! So, here you go. . .a video just for you! Four Monks Cleaning Vinegar spray bottles are available at select grocery stores and mass retailers nationwide, including the vinegar aisle at Walmart Supercenters and in the natural cleaning section at HEB stores. Sounds like a great product, never saw it here in Canada though. Darn! Vivian, you can use just regular vinegar as well. I never did see the recipe for vinegar in the laundry. Hi Virginia! I didn’t “make” any vinegar to clean my whites. I actually used Monks Cleaning Vinegar! How long do you soak in vinegar for before throwing them into the wash? Do you add vinegar to the wash cycle after soaking as well? I usually allow the socks to soak for 24 hours. Sometimes I do add vinegar to the wash as well but it’s not necessary. Can this be used on polyester fabrics to remove perspiration stains? If you’re looking to remove perspiration stains (and take the odor out) try a paste comprised of baking soda, salt and hydrogen peroxide. Let it soak in for about 20 minutes and then wash.
Will this cause other colors to fade or bleed? I have some shirts that are primarily white but have an appliqué or Smocking plate on the front that are starting to look dingy and I’m wondering if this process would be ok? Thanks! Vinegar shouldn’t do that. I think you’d be okay. It’s bleach that would do some damage. Sounds like a great product, but I’m all about buying and having less products in my home. I do, however, have multiple gallon jugs of regular white distilled vinegar, and was wondering if it would work as well in this situation? Yes, it should work just fine, Lena! Thanks for the tip! I can NEVER get my whites white after a few months. I tend to just throw them away when they get too dingy!! BTW: The Four Monks link you have doesn’t work properly. It sends you to a different website. There are so many uses for vinegar! The link should be working now. Thanks for letting me know! Hi will this work for yellow stains formed both on whites and coloured laundry which has been soaked for too long? If your clothing has yellowed, you may need to apply some lemon juice to the stains and then hang out in the sun. Sometimes the sun is the most powerful natural bleaching solution. You could also try soaking in OxyClean. Unlike bleach, OxyClean will not wreck your clothes if left soaking for extended periods of time. I like to know, what to use for rings and spots in the toilt bowl’s? Would this help a cotton sweater that now has a pinkish hue from the wash? Depending on what the pinkish hue came from the vinegar could certainly work. If the pink was caused by a dye that’s deep into the fabric, you may need to resort to good ole’ bleach, but be careful to soak it only for a short time or you’ll lose elasticity in the sweater! Have you ever put the vinegar directly into a HE washer to make towels smell better? I did this in my “old timer” washer but now that I have bought a new HE I’m a bit nervous about putting in directly into the top load washer’s tub. You could always check with the manufacturer’s customer support. If you’re looking for a solution to smelly towels and blankets, this recipe is truly a winner: https://bitzngiggles.com/how-to-remove-pet-smells-from-blankets/. Good luck! Will it be ok to use this trick on delicate fabrics like linen? Yes, vinegar shouldn’t damage linen at all. I never had much luck with bleach, and the smell literally makes me sick! I don’t mind the smell of vinegar, we always used white vinegar in the wash for pet smells. Got to try some Four Monks! Sometimes old-fashioned blueing helps too. If you don’t like the smell of vinegar, you’ll love Four Monks! The socks you treated were clean, right? They had already been washed the regular way – you were just treating them to get them whiter? Yes, Penny, you are exactly right. CAN I USE A KEAGAN WATER, I HAVE THE MACHINE I THINK THAT I JUST NEED ADJUST TO GET 20% ACID CONCENTRATION OR NOT ? Hi Federic, I have no experience with Kangen water so I really couldn’t tell you whether or not that would work. Sorry about that. Maybe another reader will see your question and know more about the properties of Kangen water.